Participants in the county’s new Community Emergency Response Team (CERT) training course receive reminders from instructor Jim Reagan on what to do once a victim has been successfully pulled from the wreckage. As he lay motionless beneath the rubble of a collapsed building on Saturday afternoon, the unresponsive man’s future looked bleak – until a team of Chester County citizens rushed into action, extricating him and initiating medical treatment. But the rescuers can’t be blamed for their failure to resuscitate “Rescue Randy:” He’s an emergency services training dummy, 175 pounds of dead weight that periodically prompted expletives from his handlers. 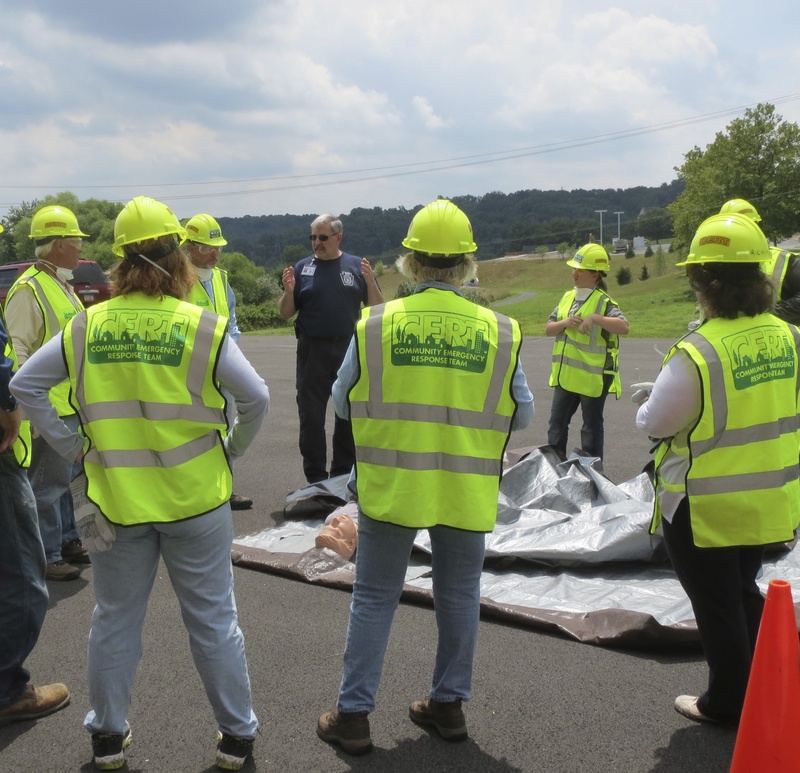 The simulated exercise culminated Community Emergency Response Team (CERT) Basic Training, a three-week course offered at the Chester County Public Safety Training Center to rave reviews from students, instructors and benefactors. “It’s a comfort to know that there are 23 more people in the community that just learned the same things I did,” said Robert Borden, one of the graduates of the first class. Jim Reagan, one of the CERT instructors, begins covering “Rescue Randy” with assorted debris to simulate the aftermath of a building collapse. Paul Brisgone, a Nottingham resident, said several years ago he joined the Chester County Medical Reserve Corps, a volunteer group formed to augment emergency medical personnel in the county. He said he took the course to hone his skills and appreciated its hands-on approach. “You learn a lot about being prepared yourself in a disaster,” he said, better enabling you to help others. Kyle McComsey of Valley Township said he was motivated to take the class as “a way to give back to the community” and felt that it prepared him to offer assistance to others in the future. 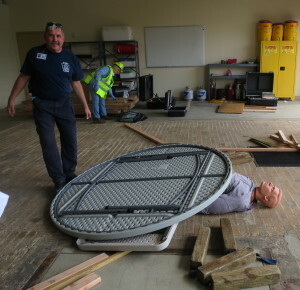 Beau Crowding, the county’s deputy director for fire services, said the opening of the long-awaited training center in South Coatesville nearly a year ago has fostered beneficial teamwork among first responders. In the past, police, deputy sheriffs, fire, fire police and emergency medical crews, many of whom are volunteers, rarely interacted and sometimes had to travel outside the county to take courses. An education building, the first segment of a three-phase construction project that will eventually include a tactical village and an indoor shooting range, enables first responders to train together, Crowding said, making invaluable contacts in the process. “Now we’re adding the citizen component,” he said. Expanding on the theory that there’s strength in numbers, Crowding said the more people who are trained in disaster preparedness and can respond before emergency crews arrive, the safer the community will be. 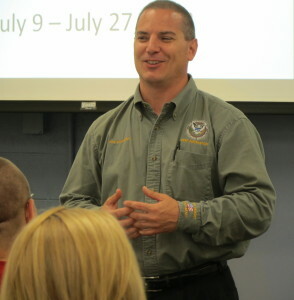 Crowding said the county was fortunate to have the services of Joe Sciandra, the emergency management coordinator for Valley Township, who is also a national CERT instructor. Joe Sciandra, one of the CERT instructors, urges the graduates to continue to be involved in public safety. CERT began nationwide in 1993 through Citizen Corps, which is administered by the Federal Emergency Management Agency (FEMA). The program was modeled after one started by the Los Angeles City Fire Department, according to the FEMA web site. In Chester County, it is supported by the Pennsylvania Emergency Management Agency (PEMA), Chester County’s Department of Emergency Services and the Brandywine Health Foundation, Crowding said. Besides rescuing a victim inside a fallen structure, the participants learned a variety of skills during about 24 hours of class time, including fire safety and suppression, establishment of a medical treatment area, head-to-toe victim assessment, safe transport, victim triage, and disaster first-aid. Sciandra told the class that their training was an integral part of the national preparedness plan, one that came into sharper focus after 9/11. “When you go back out into the community, you’re going to be empowered with some skills,” he said. “The program doesn’t end here.” He suggested that graduates talk to neighbors, friends and co-workers about the training. “You can be the spawning agent for the next class,” he said. Janet Zeis, the volunteer management coordinator for the county’s Department of Emergency Services said another class would be offered sometime in October; however, the dates haven’t been finalized. She said it was gratifying to see the level of involvement from citizens representing a diverse cross section of the county, both geographically and professionally. That camaraderie played out during a brief graduation ceremony as the instructors shared insight about the participants, such as the woman who baked CERT cupcakes for the group and the student who deserved an Emmy for playing an “obnoxious, hysterical” accident victim. Zeis handed out certificates, and a receiving line included James Manning, the board chairman of the Brandywine Health Foundation, and Frances Sheehan, its CEO. Contributions from the foundation helped finance the training center, and continuing donations ensured that the CERT class was not canceled when government money became scarce, Zeis said. The seven class instructors also shook the hands of the graduates. Manning said the benefits of the program would clearly expand well beyond the Coatesville area as more people receive life-saving training. “We’re happy to be a part of that,” he said.